Last week, I was having breakfast at Chick-fil-a. As I was sitting in my truck eating, I noticed a homeless guy sitting on the curb behind the building with his dog. 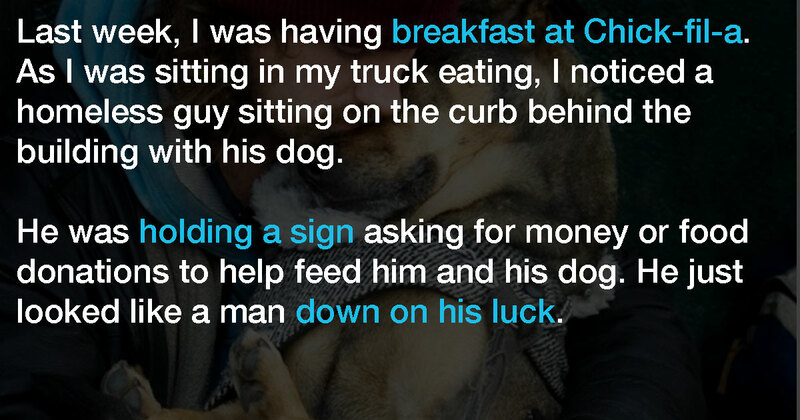 He was holding a sign asking for money or food donations to help feed him and his dog. He just looked like a man down on his luck. I observed him the entire time as I ate my breakfast. He mostly just sat there scratching his mutt and holding the sign while people drove past ignoring them. When I finished my breakfast I decided to make another run through the drive-through and ordered a large chicken biscuit combo. As I was leaving I pulled up along side him and handed him the bag of breakfast and a small bag of dog food I had in my truck for when I bring my dog to work. The bag of Chick-fil-a put a huge smile on his face but when I handed him the bag of dog food the guy literally lost it and started bawling right there on the side of my truck. After regaining his composure he exclaimed that it had been so long since somebody had treated him like a human being. I asked him if he would be willing to work hard for a decent days pay and he immediately straightened up and exclaimed that he could be the hardest worker I had ever seen. I gave him my business card and a fiver and told him to meet me at that spot the next morning and I would put him to work. 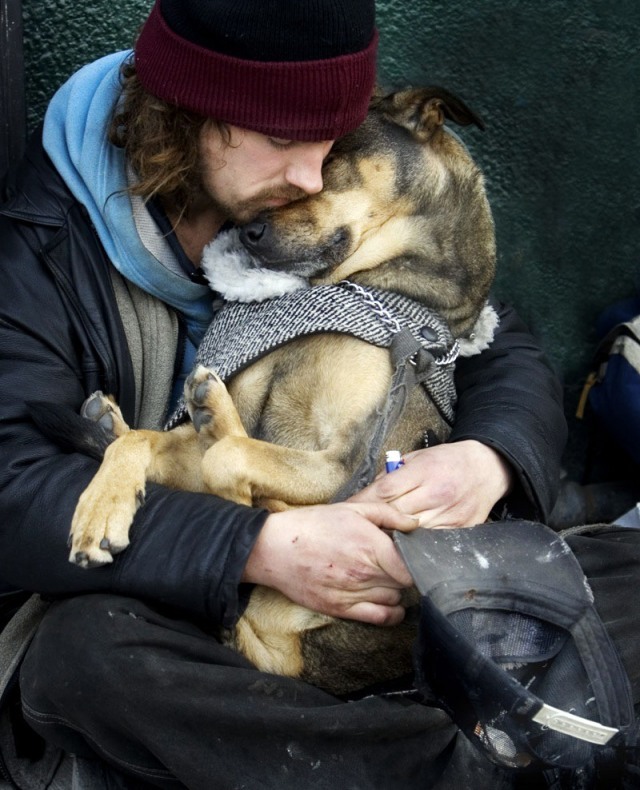 The next day I stopped in and sure enough he was waiting there for me, I took him & his dog to the jobsite. He wasn’t kidding about being a hard worker this guy carried wood around and fetched tools out of my truck for me all day without complaining once, his dog just shadowed him the entire time. During the day I learned about how he had lost his wife in a car accident, had his home that he had lived in for 35 years repossessed by the bank, had no children or family, was staying at a KOA campground and had a bunch of his life possessions stolen, had been spit on by strangers while begging for money and had all but given up on the human race as a whole. At the end of the day I took him to my bank and withdrew his days pay which amounted to $80. The look on his face was well worth it. My random act of kindness seemed to put a spark back in his eye and I continued to pick him up the rest of the week in the same spot and paying him at the end of each day. Yesterday when I dropped him off he asked me to take him to a different spot, near the KOA. He explained with the money I paid him he was going to be able to afford camping provisions for the next couple of months and told me how much it meant to him and his dog to not have to sleep outside on the cold ground. When I left him last night he looked like a different person then the man I saw hanging his head in shame behind Chick-fil-a. He promised me he would be there for me next week if I needed him and although my job-site is going to be on the other side of town next week I have already decided to continue going out of my way to pick him up and put him to work. Please SHARE this incredible story with your Facebook friends today.